We produce a vast range of hand carved wooden eating and cooking implements, from simple wooden spatulas to bespoke wooden spoons. As we work with natural materials & products, the style and shape of the completed items offered are subject to considerable natural variation, all currently available spoons can be viewed in our pictorial stock list (Excl standard types ie Medieval styled products), once you have chosen your spoon, please order via the product description below, not forgetting to enter the code number for your chosen spoon into the stock code box. 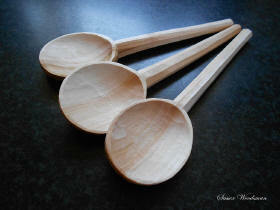 We produce a large number of wooden spoons in many different styles and sizes, ranging from small eating spoons to large serving spoons, with our medium sized spoon (approx table spoon size) being the most popular. Unlike mass produced products, each and every one of our spoons has been individually crafted by hand using traditional hand tools. Click here to view available stock. Hand carved Medieval style wooden spoon, perfect for re-enactors, museums, schools & living history demonstrators, the spoon is carved in the Tudor "lollipop" style with an oversized bowl and short narrow handle. In keeping with the period the spoon is not sanded, but has a finish that shows the tool marks created during it's manufacture. Hazel, Birch, Poplar, Willow & Sycamore. Our hand carved cooking spoon is our personal spoon of choice in the kitchen, not just because we made it, but because of it's tactile feel and comfort whilst in the hand. In keeping with it's rustic charm, each spoon has a finish that shows the carving marks created during it's manufacture. We produce a selection of hand carved cooking spatulas in a number of different styles and sizes, these are typically of a ' standard commercial size' but larger and smaller spatulas are available on request. 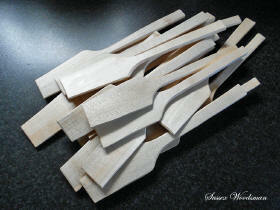 Styles and shapes vary, photo shows a representative sample of the spatulas we supply. 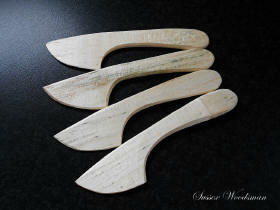 Hand crafted butter spreader or to give it it's proper name, a Smörkniv, these are a traditional Swedish form of wooden cutlery used for applying butter and soft spreads to bread. Always hand wash your spoon with soapy water, do not put it in the dish washer, pat dry after washing. DO NOT immerse the spoon or let the spoon sit in water for long periods of time. We do not generally oil our spoons as we much prefer to let time, tide & food acids give the spoon a natural patina, however, we do occasionally use pure tung oil and walnut oil, these finishes may not be suitable for allergy sufferers, oiled spoons are clearly identified as such. 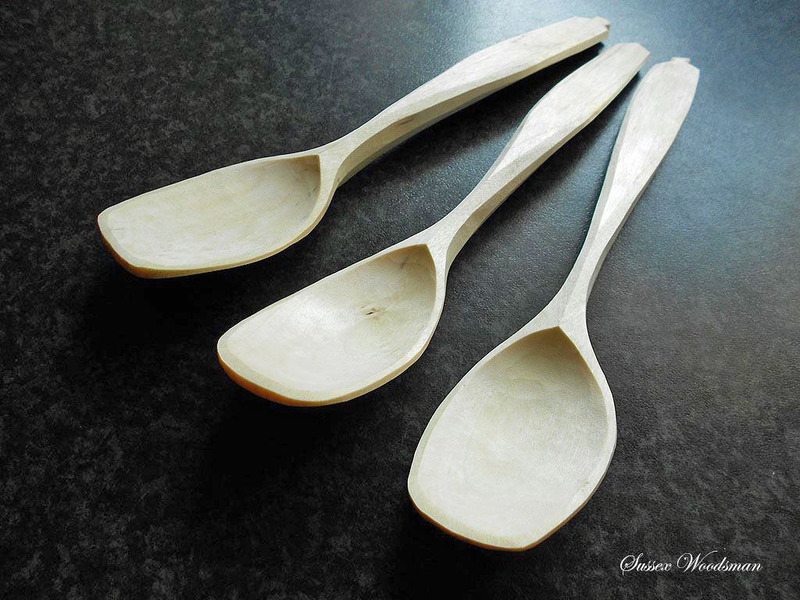 You may prefer to give your spoon a light coat of oil, we suggest pure tung oil, pure flax oil or walnut oil, please do not use vegetable or olive oil as it can go rancid, boiled linseed and danish oils are not suitable as they are not food safe. Sanded spoons will go “fluffy” after their first wetting, this is perfectly normal, just carry on using the spoon and the fluffiness will wear away in no time at all, leaving you with a beautifully smooth spoon. We use chalk paint on our painted handles, this has been treated with a finishing wax/lacquer to make the paint water resistant NOT waterproof, you will notice the paint will wear on high spots as the spoon is used and some colour bleed may occur after washing, particularly if the spoon has been immersed in water. UK Delivery via Courier from £ 6.95.